Almost as fun as it looks. Print your own, if you’d like! 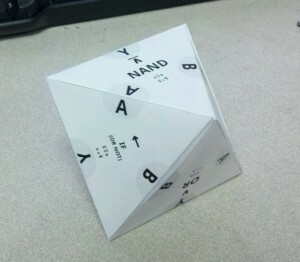 This octahedral toy/tool/thing represents manipulations on a logic gate with two inputs A and B and one output Y. A face of the object says what operation it executes, such as “AND”. From there, each side of the face is marked with a variable—A, B, or Y—and rotating past that edge shows you the result of inverting that variable. For example, if I start at AND, I might turn past Y to NAND (AND with inverted output). Then, I might turn past A to IF (another name for OR NOT), because that’s what /A NAND B is. Finally, I might turn past B to OR, since that’s A OR NOT /B. Alternatively, you might choose a starting point and an ending point, then trace the path between them to determine how many inverters are necessary to do the conversion. Note that any face is at most three turns from any other. Polar opposites such as AND and OR are on opposite faces, and changing one to the other involves inverting each input and the output. The somewhat uncommon logical operator names IMP (short for IMPLIES), NIMP, IF, and NIF appear as one-word substitutes for operations that invert B (NAND NOT, AND NOT, OR NOT, and NOR NOT, respectively). The two-word versions appear as a subtitle. This isn’t quite as great as it could be. The text sizes and layout need a lot of work; the expression text is only barely big enough to read. However, since the time may never come for improvement, here it is for you to play with.